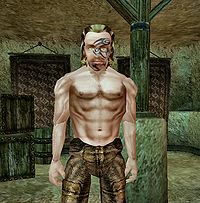 Garding the Bold is a Nord barbarian located behind a locked door in the Haunted Manor in Vivec's St. Olms canton. He is Dram Bero's champion. He wears common pants and two common rings. Aside from his natural resistance to shock, immunity to frost, ability to shield himself, and a natural frost damage spell, he knows no spells. This page was last modified on 22 May 2014, at 07:26.